CM Magazine: J.R.R. Tolkien: The Man Who Created The Lord of the Rings. J.R.R. Tolkien: The Man Who Created The Lord of the Rings. "This, then, is the story of J.R.R. Tolkien, the man who wrote so much, so well for so many of us. This is the story of his beginnings, his middle, and his end. It is the story of an ordinary man who did extraordinary things. It is the story of mothers and fathers, daughters and sons. A story of God, religion, happiness, suffering, friendship and genius. Oh, and the story of The Lord of the Rings, one of the greatest books ever written." Coren's claim that The Lord of the Rings is one of the greatest books ever written is not exaggerated. He begins his biography by pointing out that people have named The Lord of the Rings the finest book of the 20th century in poll after poll. Even a survey conducted by the highly esteemed Folio Society of Britain, which included books from any period in history, ranked The Lord of the Rings as the number one favourite. Michael Coren is a controversial Toronto talk show host and syndicated columnist whose writings appear in Sun newspapers across Canada. He has written a number of books, including biographies of G.K. Chesterton, H.G.Wells, C.S. Lewis and Sir Arthur Conan Doyle. J.R.R. Tolkien is his second biography written for young people, and, in it, Coren has once again simplified the language needed to explain complicated concepts (such as religious discrimination or the causes of World War I) without resorting to a condescending tone. The book is divided into seven chapters, moving the reader through Tolkien's childhood in South Africa, the early loss of his parents, his career as a university professor, his friendships, and the long loving relationship he had with his wife Edith and their four children. 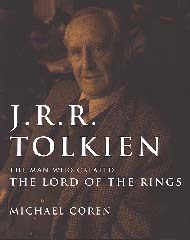 Coren has included two very brief re-tellings of The Hobbit and The Lord of the Rings trilogy, useful perhaps for those who have not read these books, but surely unnecessary for the young Tolkien fan most likely to pick up this biography. The author's frequent use of sentence fragments, presumably to heighten dramatic impact, mars an otherwise clear and lively style. Unfortunately, the volume's sepia cover and black and white photographs, which are primarily of places rather than people, give the book a dreary and somewhat stuffy look. A bibliography of books by and about Tolkien, as well as an excellent index add to the value of the book as an information resource. Anticipation of the film release of The Fellowship of the Ring in December, 2001, to be followed by The Two Towers in 2002 and The Return of the King in 2003, has sparked a huge resurgence of interest in the Tolkien novels. J.R.R. Tolkien: The Man Who Created The Lord of the Rings is a thoughtful and very readable biography for young Tolkien fans; however at $27.95 school librarians might choose to refurbish their collections of the original novels and wait for the paperback version of Coren's biography to be released. Senior high school librarians might opt for T.A. Shippey's recently published biography, J.R.R. Tolkien: Author of the Century.